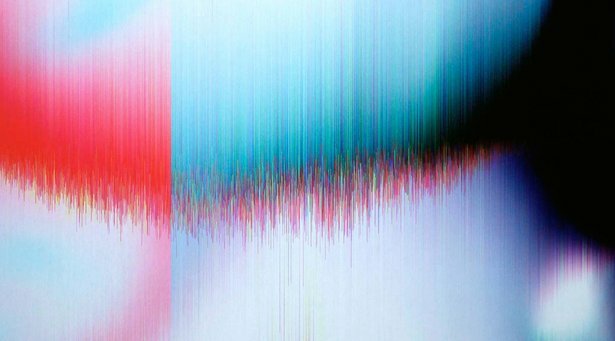 James Hoff is an enterprising artist whose work with music and sound is part of a multidisciplinary practice. Based in New York, he is accomplished as a painter, with well-reviewed exhibitions in international museums and gallery spaces, and a conceptual artist whose ideas take up in the ether all around. He is also a poet and, as co-founder (with Miriam Katzeff) of Primary Information, a publisher of art-books by contemporary minds as well as archival finds from as far back as the 1960s. Musically, Hoff is best-known for Blaster, an album released by the mindful electronic-music label PAN in 2014. Marked by twitchy, glitchy rhythms that hit with purpose and force, the album features sound files that Hoff infects with computer viruses that he collects and catalogs for all their transformative effects. (His paintings make use of viruses too, subjecting the code behind images to incursions that alter them at the core.) His soundworks with viral accompaniment also include a series of cell-phone ringtones that are both hyper-familiar and mangled out of sorts. 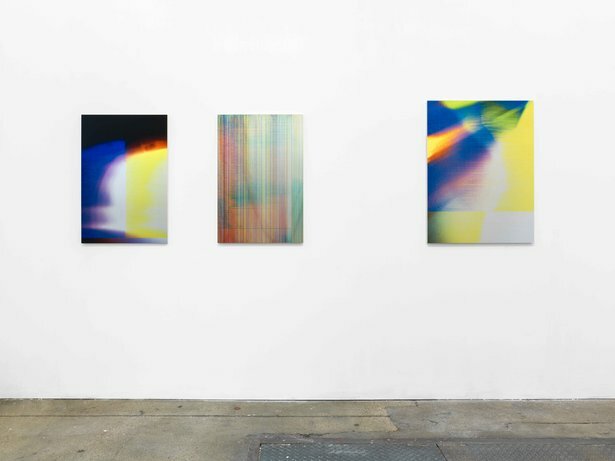 Since the release of Blaster, Hoff has continued his work in many media, with a solo show of paintings in New York, an exhibition of painting and sound in Berlin, and a project commissioned for on-air use by Germany’s national broadcaster, Deutschlandradio. Here, from his home in Brooklyn with a plate of delicious donuts on offer, Hoff talks about his work and the many ways it winds through the world. Your work with viruses has developed and evolved and moved into different arenas. What interests you about the virus as a tool? For me, the use of viruses is interesting in two ways. It allows me to generate work in a different way than I would if I was just going in and saying I want to create something, and it allows me to work across mediums. It gives me an impetus as a conceptual framework and also a tool for creating work across mediums in a variety of genres. Because a virus is meant to hide in plain sight and take on different faces, it allows me—as someone who’s always been interested in different types of art-making more than just doing any one thing—license to work across platforms. I really like that about it. Within the virus metaphor, there’s always mutation, and there are different mutations that manifest themselves in different ways. Some of your work, particularly the album Blaster, seems to take up dance music as a subject. Is dance music especially receptive to the idea of viral incursion? I think in our times now it is more receptive—just the way people are interested in dance music that contains harsh noise or challenging palettes—but I think that has more to do with things far aside of my project. When I decided I was going to make Blaster, I had infected a few computer tones, and I was interested in the process and was trying to figure it out. I had infected some tones that were basically chirps and hums from the computer, the motor whizzing and stuff like that. I had a notion of where I wanted to go and what I wanted to do—it was formulating itself for me conceptually. So I took these stock computer sounds and infected them and generated a lot of source material. I was listening to it on the subway with ear buds and then some kids came on and started breakdancing. They had beat music playing, and it all overlapped in my hearing range—that’s when I thought: “This is the way to go.” That’s also where my choice of the Blaster virus comes from. When you think of a boombox, at least in my generation as a kid, we called them ghettoblasters. That’s why I chose Blaster over Stuxnet or the Morris worm or something else. There was intention and serendipity involved, a bit of both. Do you cede your role in the creation process to the virus entirely? I’m interested in algorithmic processing in composition, but I’m not interested in it as an end-all. I don’t hold up process in composition over my own license to create. Most of the things I work with, musically speaking, I’m doing something else too—I’m using the process to create a palette, but then I’m creating on top of that. If you listen to Blaster, the second side is some of the beats and samples as they were corrupted. But the first side is actually me using those beats and samples to create new music. The concept and processing is important, but I also really value reserving the right as an artist to set the process aside and use it to create something that the machine couldn’t create on its own. You’ve used a similar process in new and different work since the album came out. How has it come to differ? Some of the newer work relies on a transcription process (done through Max) that assigns a note to each character in the virus source code, plotting it to MIDI in real time. The Blaster material and other material in that vein is very specific in the way it sounds. But this other process can be open to other instrumentation and allow for a larger palette, so I can approach different genre forms. For my exhibition in Berlin, I took Stuxnet code and made it into Keith Jarrett-style arpeggiated piano. It sounds like new age music basically, and it lasts for days—that code is huge. You also made a series of pieces called Operation Olympic Games for Deutschlandradio. What is the significance of the title? That was the name of the CIA operation that was used to create Stuxnet, Flame, and Skywiper. The long-form German radio piece is made from Blaster, Stuxnet, and Skywiper. Skywiper was the name of my gallery show in New York. The title of the show in Berlin was The Quick Brown Fox Jumps Over the Lazy Dog. It contains every letter in the English language—it’s used for typing tests, and it’s a code that’s used to test algorithms in computer software. Also, when the Russians and the Americans set up their transatlantic cable in the ’60s, it was the first message the Americans sent through. The Russians were really confused by it—they didn’t understand what it was. Your process has evolved a lot and continues to evolve. What is the basic process, though, for how you made Blaster? I use a hex editor called Hex Fiend and, if I took a clap, for instance, and throw it in there, I get the clap broken down into hexadecimal code. I then take the virus code and drop it into that. I impregnate the code with the virus, essentially. Depending on where (and how many times) you place the code, it will affect it very differently. There’s a wide variance to how you can affect the original sound. That’s how I generated about 800 samples for Blaster, and those became the building blocks for the album. What role did Live play in the process? I used Live for everything pretty much, but my use of it is pretty rudimentary in terms of what it’s capable of. But maybe that’s an important distinction. For me, a lot of the stuff that I’ve been making, as I move forward with the work that I’m doing, gives me more opportunity to explore and learn that program instead of coming to it already knowing everything. I’ve had Live since 2002 or 2003, mostly back in the day for performing live, but with Blaster, everything is written, composed, and arranged in Live. My live setup is through Live at this point as well. Right now I’m starting to use some sound-design equipment that allows me to modify the infections after they’ve happened and get a little bit different tonal range out of it. That’s outside of Live, but everything else is still in. I just started experimenting. We’ll see how it works out. We’ve talked mostly about your music, but your painting work is at least as significant. Do you go back and forth between music and painting, or do you take periods to focus on one or the other at a time? Painting and music are pretty simultaneous at this point. The third pillar for me is Primary Information and publishing. I tend to think of my work as a publisher as one thing and my work as an artist as another. Within the frame of art, music and visual work are always in process hand-in-hand. They feed different interests for me as an artist. They can also both have their ruts, so it’s nice to switch between them in an effort to try and avoid those ruts. Is sound more receptive to viral incursions than images, or is it the other way around? I would say visual material is far more receptive—there’s far more you can do with it. I take images and infect them in all sorts of different ways and then they go into a folder. Any one I think might work as a painting I pull out and put in a “maybe” folder. For every show of say 20 paintings, there are at least 1,000 images that get generated. Maybe 50 of those would be “maybes,” and then I go through and winnow those down. The original images are all basic support material for paintings. Not always but usually. If visual material is more receptive and malleable, do you have a preference for the paintings or music in terms of how works in the end? On a material level I think the painting is more receptive to the process, but on a conceptual level music is the medium I favor. The way it self-distributes through culture is far superior to painting. It’s hard to accidentally see a painting and have it get stuck in your head. I’m a pretty passive listener—I always listen to music while I’m doing something else—and I like the idea of music I make being in the background of other things. I like the idea of sitting and listening, and it’s nice when people come see me play a show, but I’m much more intrigued by the idea of my music showing up somewhere you don’t expect, to have it be a background to everyday life. The challenge with the virus works is to get it that point—to get my own production work to the point where I can make music that would be seamless in different environments but also retain some sort of identity. I wouldn’t want to create pure pop music from viruses, but I would love it if something ended up in that domain or in a dentist’s office waiting room. I like the idea that music has a potential to travel in ways its producer could never imagine. Keep up with James Hoff on his website. Images from The Quick Brown Fox Jumps Over the Lazy Dog courtesy of Supportico Lopez. Creative strategies, compositional process, and using Live with other technologies are all themes at this year's Loop, Ableton's Summit for Music Makers.